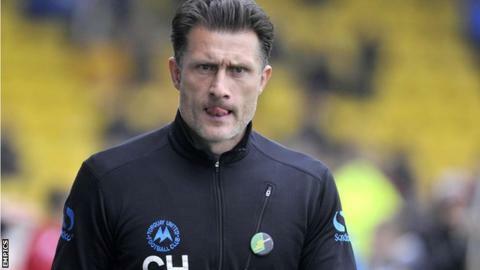 Torquay extended their stay in the Football League for at least one more game as they beat Devon rivals Exeter. Tom Nicholls punished a defensive error by slipping a perfect ball to Scot Bennett, who sidefooted home to put Exeter, who are not safe yet, in front. But the Gulls equalised when Courtney Cameron floated a free-kick into the top corner from 20 yards out. And Ashley Yeoman pounced on Anthony O'Connor's through ball and slotted it past Christy Pym to seal the win. With Bristol Rovers, Northampton and Wycombe all losing, Torquay closed the gap on them to five points, but only have six left to play for in their two remaining games this season. Exeter, meanwhile, are only two points above the relegation zone. The Gulls started the brighter as Shaquille Coulthirst had a shot deflected over the bar after just three minutes, and Anthony O'Connor glanced a header just wide from a Cameron dead-ball kick before Elliot Benyon shot over from 18 yards. Exeter went in front when Anthony O'Connor's mistake let in Nicholls down the left-hand side, with the youngster reaching the byeline and pulling the ball back to Bennett who calmly stroked it home for his sixth goal of the season. Benyon should have equalised five minutes later, but he headed wide after some good work down the left flank led to Nathan Craig floating a perfect cross to the far post. The Gulls turned it around after the break, however, as they scored twice in three minutes to stave off relegation for at least a few more days. Cameron got his first goal for the club and with tails up, Torquay got the winner three minutes later as Yeoman latched on to a long ball from O'Connor, beat Jordan Moore-Taylor for pace and slotted it past the on-rushing Pym. City had a numerous chances to equalise in the final few minutes as Torquay desperately clung on. Eliot Richards shot just wide from the edge of the box before substitute David Wheeler spurned three good chances in quick succession in the final 10 minutes, the best a side-footed effort after a free kick into the box which he put over the bar. Exeter could have equalised in the last minute of stoppage time as Richards got his head to a corner, only for Martin Rice to pull off a great save. Match ends, Exeter City 1, Torquay United 2. Second Half ends, Exeter City 1, Torquay United 2. Corner, Exeter City. Conceded by Martin Rice. Attempt saved. Eliot Richards (Exeter City) header from the centre of the box is saved in the top centre of the goal. Attempt saved. Liam Sercombe (Exeter City) right footed shot from outside the box is saved in the top centre of the goal. Substitution, Torquay United. Ben Harding replaces Shaquile Coulthirst. Attempt missed. David Wheeler (Exeter City) left footed shot from very close range is too high. Foul by Ashley Yeoman (Torquay United). Attempt blocked. Matt Grimes (Exeter City) right footed shot from more than 40 yards on the right wing is blocked. Damon Lathrope (Torquay United) is shown the yellow card. Foul by Damon Lathrope (Torquay United). Attempt missed. David Wheeler (Exeter City) right footed shot from the right side of the box misses to the left. Substitution, Exeter City. Matt Grimes replaces John O'Flynn. Corner, Exeter City. Conceded by Anthony O'Connor. Attempt blocked. David Wheeler (Exeter City) left footed shot from the right side of the box is blocked. Craig Woodman (Exeter City) is shown the yellow card. Hand ball by Craig Woodman (Exeter City). Attempt saved. Scott Bennett (Exeter City) right footed shot from the centre of the box is saved in the centre of the goal. Corner, Exeter City. Conceded by Courtney Cameron. Attempt missed. Eliot Richards (Exeter City) right footed shot from outside the box is close, but misses to the left. Substitution, Exeter City. David Wheeler replaces Matthew Gill. Ashley Yeoman (Torquay United) is shown the yellow card. Attempt blocked. Matt Oakley (Exeter City) right footed shot from outside the box is blocked. Foul by Pat Baldwin (Exeter City). Danny Butterfield (Exeter City) wins a free kick on the left wing. Anthony O'Connor (Torquay United) wins a free kick on the right wing. Foul by John O'Flynn (Exeter City). Attempt saved. Elliot Benyon (Torquay United) right footed shot from the centre of the box is saved in the centre of the goal. Goal! Exeter City 1, Torquay United 2. Ashley Yeoman (Torquay United) right footed shot from the centre of the box to the centre of the goal. Assisted by Baily Cargill. Matthew Gill (Exeter City) wins a free kick in the defensive half.